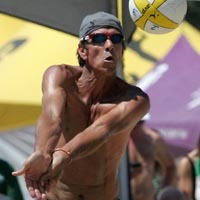 Nicknamed �Fro�, Frohoff first played beach volleyball in 1968 under the instruction of his parents. Frohoff, who played professionally in (Italy, 1983-84), enjoys golf, surfing, playing the drums and guitar, home improvements and couch flying. His is married (Tiffany). The Frohoff�s are expecting a child this July.